(Nanowerk News) Understanding the anatomical structure and function of the brain is a longstanding goal in neuroscience and a top priority of President Obama’s brain initiative. Electrical monitoring and stimulation of neuronal signaling is a mainstay technique for studying brain function, while emerging optical techniques—which use photons instead of electrons—are opening new opportunities for visualizing neural network structure and exploring brain functions. Electrical and optical techniques offer distinct and complementary advantages that, if used together, could offer profound benefits for studying the brain at high resolution. Combining these technologies is challenging, however, because conventional metal electrode technologies are too thick (>500 nm) to be transparent to light, making them incompatible with many optical approaches. To help overcome these challenges, DARPA has created a proof-of-concept tool that demonstrates much smaller, transparent contacts that can measure and stimulate neural tissue using electrical and optical methods at the same time. Researchers at the University of Wisconsin at Madison developed the new technology with support from DARPA’s Reliable Neural-Interface Technology (RE-NET) program. 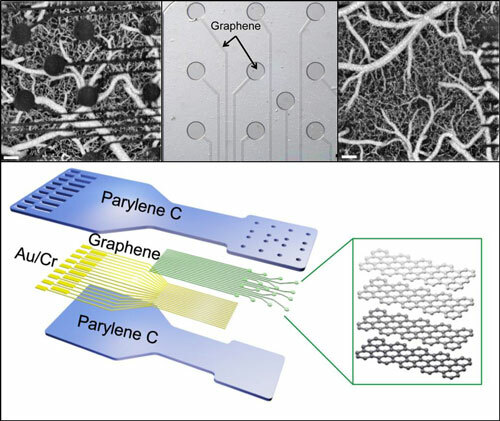 It is described in detail in a paper in Nature Communications ("Graphene-based carbon-layered electrode array technology for neural imaging and optogenetic applications"). RE-NET is part of a broader portfolio of programs within DARPA that support President Obama’s brain initiative. These programs include ongoing efforts designed to advance fundamental understanding of the brain’s dynamics to drive applications, manufacture sensing systems for neuroscience applications and therapies and analyze large data sets.